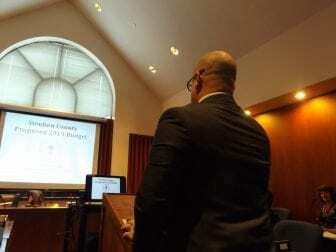 BATH, NY (WSKG) — Like counties across New York, Steuben’s budget for next year has to deal with a few new state mandates, including Raise the Age and new indigent defense requirements. Raise the Age raises the age of criminal responsibility to 18 years old. 16- and 17-year-olds now have their cases handled in a youth part of the state supreme court or in family court. Meanwhile, the changes to indigent defense stems from a lawsuit that cited certain counties – not Steuben – for failing to provide effective counsel to people accused of crimes. Those mandates are expected to cost about $2 million. The good news for the county is that each should be covered by state reimbursements, assuming Steuben meets certain requirements. Still, County Manager Jack Wheeler warned that those state reimbursements are not necessarily forever. “Should finances become such a problem that they have to cut some place, that’s an area they could potentially cut,” said Wheeler. “It’s a potential and it’s a year-to-year potential,” he said. Wheeler added that he’s confident the state will cover Raise the Age in the short term, since it was such a big issue. Steuben County also saw budget changes as part of its effort to attack the opioid epidemic. For a rural county, it’s been hit pretty hard. The plan to fight the epidemic included hiring more sheriff’s deputies and other expenses. That’s reflected in the budget. “The legislature really embraced that, endorsed it and is implementing it,” Wheeler said. Elsewhere, the county sales tax is up from last year while the property tax levy is down. The Steuben County budget is scheduled to be adopted later this month.